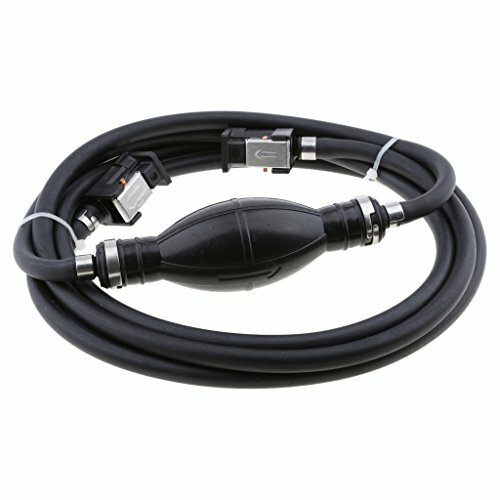 Five Oceans Universal Marine Nylon Braided Fuel Line Outboard with Primer Bulb, 3/8", 5/16"
Five Oceans One Way Valve Universal Primer Bulb, 3/8" & 5/16"
This 6 Gallon Fuel Tank/Portable low-permeation with Gauge is one of Five Ocean's premium tanks. They're highly robust and durable; additionally, meet ever safety requirement for those of us who enjoy marine life. Each tank features a 90 degree 1/4" NPT fuel fitting making it easy-to-read and slash resistant. It also provides high contrast fuel gauge that accurately monitors the level of remaining fuel without having to remove the fuel cap. This product is great for export, not EPA approved. Each of these tanks also virtually eliminates fuel evaporation and loss by containing fuel vapor within the tank instead of venting it wastefully to the atmosphere. Which in turn is better for the environment and will reduce fuel costs, keeping all the fuel you purchase where it belongs-in your tank. Kindly note that for transport or the movement of fuel tank the vent (Located on Top of Cap) must be closed in order to avoid leakage. In addition, a running engine must have the fuel tank's vent open for proper operation. Above / Below Deck: Above Deck. 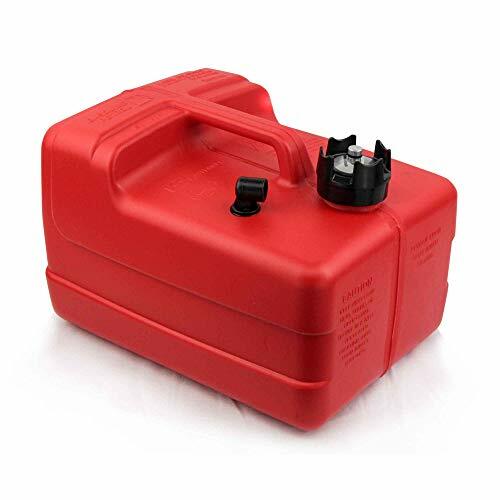 Capacity: 6 Gallons (22 L). Any low-permeation tank may become pressurized when exposed to direct sunlight or any other source of heat. Under these conditions, you may see the tank expand or bulge. Do not place the tank in a confined area that prevents this normal expansion. Pressurized low-permeation fuel system components require a thread sealant specifically designed for the unique conditions they create to maintain a leak-proof seal at their threaded connections. Tape-type thread sealants will not withstand the pressurized conditions potentially created within low-permeation systems. MONITORING SYSTEM that accurately reads fuel levels. 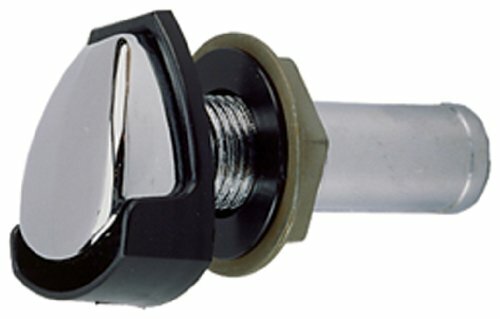 NPT FUEL FITTING with 90 degree angle and 1/4 thread. Dimensions: 23 (584mm) L x 11 13/32 (289 mm) W x 8 27/32 (224 mm) H.
ECO FRIENDLY by eliminating virtually most of the fuel vapor. 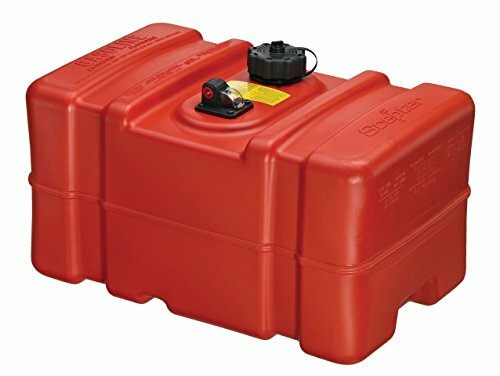 This 3 Gallon Marine Portable Fuel Tank low-permeation with Gauge is one of Five Ocean's premium tanks. They're highly robust and durable; additionally, meet ever safety requirement for those of us who enjoy marine life. 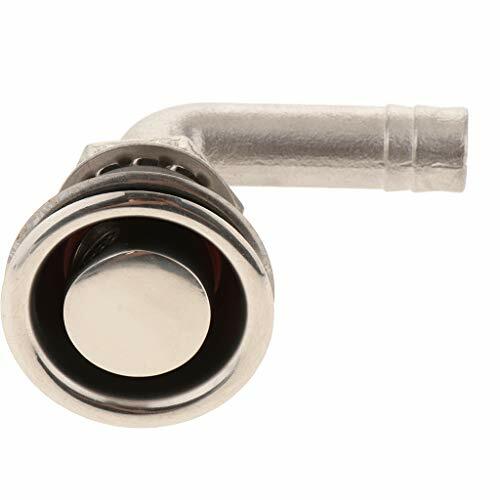 Each tank features a 90 degree 1/4" NPT fuel fitting making it easy-to-read and sloshes resistant. It also provides high contrast fuel gauge that accurately monitors the level of remaining fuel without having to remove the fuel cap. This product is great for export, not EPA approved. Each of these tanks also virtually eliminates fuel evaporation and loss by containing fuel vapor within the tank instead of venting it wastefully to the atmosphere. Which in turn is better for the environment and will reduce fuel costs, keeping all the fuel you purchase where it belongs-in your tank. Material: Multi-Layer High Density Polyethylene. Note: Any low-permeation tank may become pressurized when exposed to direct sunlight or any other source of heat. Under these conditions, you may see the tank expand or bulge. Do not place the tank in a confined area that prevents this normal expansion. Pressurized low-permeation fuel system components require a thread sealant specifically designed for the unique conditions they create to maintain a leak-proof seal at their threaded connections. Tape-type thread sealants will not withstand the pressurized conditions potentially created within low-permeation systems. 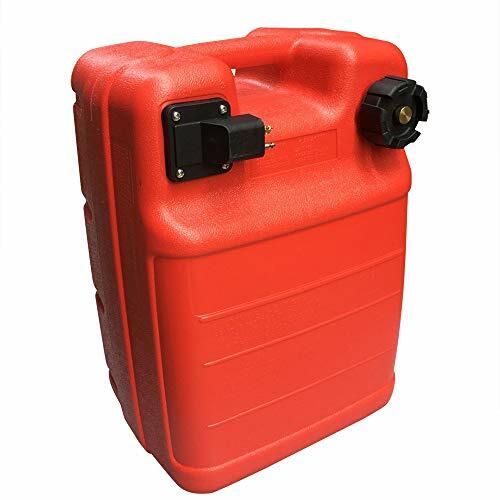 12 gallon/45L EPA portable fuel tank (tall profile) is molded from UV stabilized, high density polyethylene for excellent durability and long life. Automatic air inflow valve/fuel cap system is ethanol and alcohol compliant and meets EPA/CARB,ABYC standards. Automatic air inflow valve/fuel cap system with 1/4 NPT fuel pick-up/sight gauge, accepts standard marine tank fittings. "Eco checked". Perko 18-3252 0506DP4CHR Fuel Tank Vent Straight 5/8"
Perko's chrome plated zinc with black plastic splash guard and removable 30 mesh mounted wire screen flame arrester. Hose size 5/8". Maximum hull thickness 3/4". Built from quality materials. Flip-top gas fill with integral tank vent for O.E.M. use. Features include; Hinged flip-top cap, integral tank vent with flame arrestor, and continuous venting while providing effective prevention of water intrusion. All plastic construction. PREMIUM QUALITY: Rubber hand pump that starts siphoning liquid flow quickly. 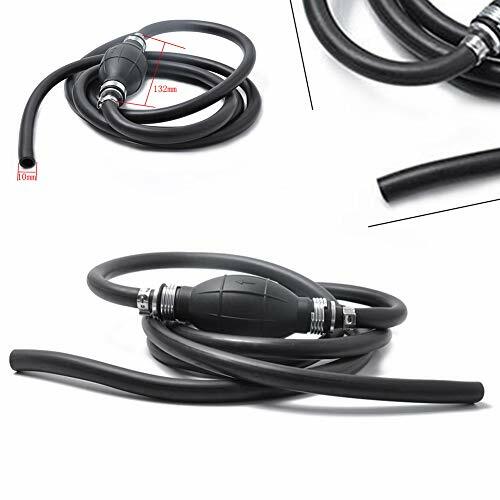 2 flexible Duarable PVC transparent hoses provide easy reach into containers, petrol resistant, avoid corrosion. 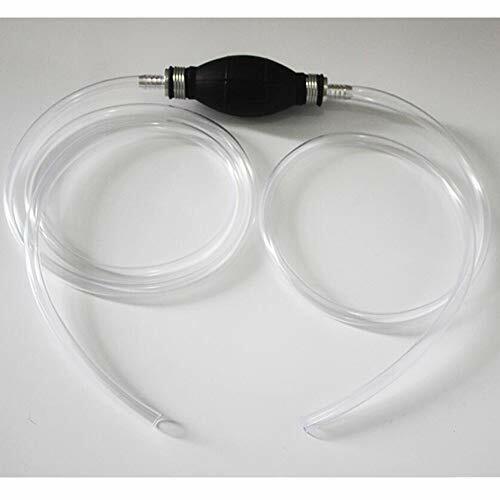 EASY TO USE: Lightweight and portable siphon manual pump, ideal for various vehicles without anti-theft filter net, such as lawn Mower, brush cutter, hedge trimmer, etc. 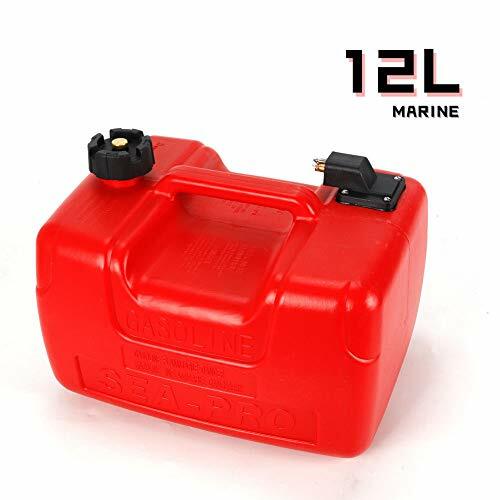 Outboard external fuel tank is anti-static, anti-aging, corrosion-resistant red plastic fuel tank. Adapter 9.9 horsepower outboard engine models can be used for a variety of models of outboard machine. The fuel tank with filter to ensure clean fuel, traveling thousands of miles worries. Lightweight and portable, never rust, durable, beautiful, easy to use handle design, easy to place horizontal fuel tank. Standard nozzle: Yamaha outboard computer interface from the back holes. Note:This is universal fuel line without engine or tank fittings. 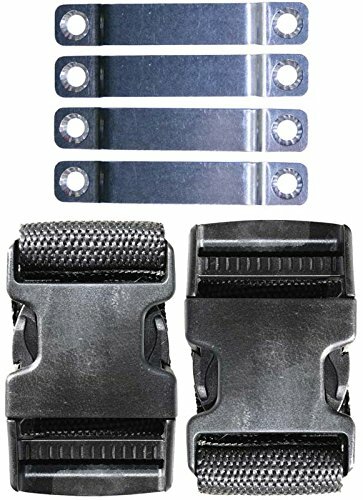 - Comes with a rubber bulb and 3/8" fuel hose and a 360 stainless steel hose clamps. - Built-in rubber bulb offers superior UV resistance and anti-oxidation performance. - Upgrade older tanks to the latest low-permeation fuel line standards with this. - Bulb is designed to maintain flexibility,preventing collapse under hot/cold temperature. - Meets EPA low permeation mandates and prevents fuel evaporation. - Suitable for Boats,RV,Tractors and Caravans. Comes with a rubber bulb and 3/8" fuel hose and a 360 stainless steel hose clamps. Built-in rubber bulb offers superior UV resistance and anti-oxidation performance. upgrade older tanks to the Latest low-permeation fuel line standards with this. bulb is designed to maintain flexibility,preventing collapse under hot/cold temperature. Meets EPA low permeation mandates and prevents fuel evaporation. - Suitable for modern watercraft, boat, yacht. Suitable for modern watercraft, boat, yacht. - 100% Brand new and good quality. - Brings fuel from the tank up the line, also prevent fuel from returning back to the tank and keeps it in the line. - Arrow marked on body, showing fluid flow direction, Prevents fuel draining back to the tank, keeps it in the line. - Stable characteristics, high reliability. - Easy installation and replacement. Dueto the difference between different monitors, the picture may notreflect the actual color of the item. Please understand, Thank you. Brings fuel from the tank up the line, also prevent fuel from returning back to the tank and keeps it in the line. Arrow marked on body, showing fluid flow direction, Prevents fuel draining back to the tank, keeps it in the line. This Outboard Fule tank is made from Strong UV Stabilised Plastic (polyethylene). It's light wieght compact and has a convient carry handle. It's perfect for Small to Large Boats, Inflatables, Tinnies, Canoes and even Kayaks. Lightweight and portable, never rust, durable, beautiful, easy to use handle design, easy to place horizontal fuel tank. Standard nozzle: outboard motor above 6HP interface from the back holes.